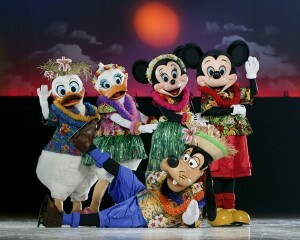 Giveaway - Disney on Ice Family 4-Pack Tickets (Ends 8/31 at 12:01 AM EST) | A Savings WOW! Disney on Ice Mickey & Minnie’s Magical Journey will be coming to to the Chicago area from September 7th through September 11th at the United Center. Make imagination your destination! Join Mickey Mouse and Minnie Mouse on a journey into the magical worlds of Disney’s The Little Mermaid, The Lion King, Peter Pan and Lilo & Stitch. Discover Ariel and Sebastian’s enchanting undersea kingdom; visit the Pride Lands with Simba and Nala; soar through starry skies with Peter Pan and his sassy fairy friend Tinker Bell; and say “aloha” to fun with Lilo and Stitch. You’ll be captivated by the music, beauty and laughter in a journey so magical, you’ll never want to go home. 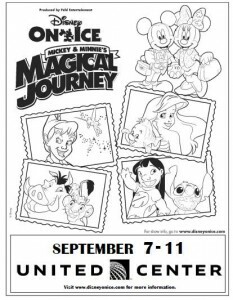 Print out this coloring sheet and share it with your favorite Disney on Ice Mickey & Minnie’s Magical Journey fan! 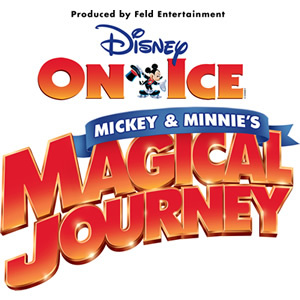 Purchase your tickets for Disney on Ice Mickey & Minnie’s Magical Journey at Ticketmaster. The winner of this giveaway will receive a family 4-pack of tickets to Disney on Ice Mickey & Minnie’s Magical Journey for either the Wednesday, September 7th at 7:00 PM or Thursday, September 8th at 7:00 PM at the United Center (winner’s choice). The winner MUST be able to attend the show on one of these dates. Disclosure: Feld Entertainment provided the tickets for the giveaway, as well as a set for us to review the show in our role as Feld Family Activators. All opinions are our own honest opinions. Daisy Duck is my favorite Disney character. We’d like to go Thursday, September 8th at 7:00 PM. Hope we win!! My favorite Disney character is Lumiere in Beauty and the Beast. My favorite Disney character is Stitch from Lilo and Stitch! I would love to win!! We love mickey and minnie!! WE would prefer to go Thursday Sept 8th at 7pm but either day will be fine for us. We’d love to win these!! My favorite charater is Ariel.